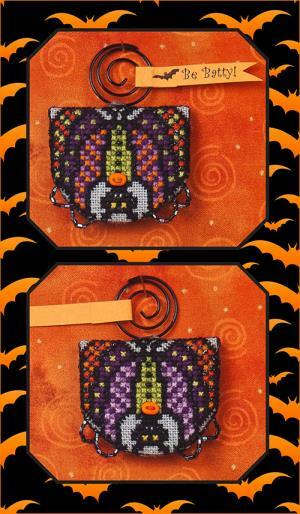 From Just Nan, He is dressed for Halloween in 2 different color combinations, both accented with black beads and a bit of metallic braid. His neon orange bow tie is a 2-hole bead, and a sparkly garland of midnight hex beads drapes from his folded wings. Batty Boris is stitched on 32 CT Zweigart Stormy Night Belfast Linen or 32 CT Pearl Grey Belfast Linen with DMC and Kreinik 005L #4 Braid. Design area is 3" X 2". Chartpack contains beads, 2 orange bow ties, spiral hanger and banner.